Someone please call the burn unit. Well, at least for McDonalds, Wendy’s and any other competitor of Burger King. 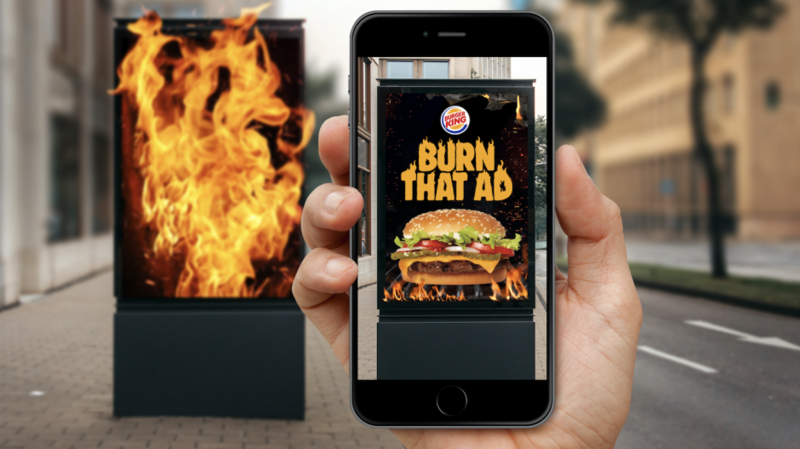 With their new ad campaign using augmented reality (AR), they’re allowing their users to literally “burn” their competitors ads and awarding them with a free Whopper. The biggest reason why this is a brilliantly executed campaign? It’s allowing Burger King to use the ad spots of their competitors and turn it into their own—AND it’s allowing me to write an article full of fire-based puns. “Technology as a means to provide the best customer experience is one of our main investment targets in 2019. To create the BK Express experience, our exclusive payment technology via mobile phone available all around Brazil, we offer some fun interaction in augmented reality for our brand’s lovers through the app. And those using the service also gets a free Whopper”, said Ariel Grunkraut, Burger King’s marketing and sales director for Brazil. So who’s the agency that made pyromaniacs out of Burger King? Enter DAVID The Agency, an ad agency based out of Sao Paolo, Brazil. Their objective behind this was to actually promote BK Express, an app that would allow customers to order and avoid standing in line. “Augmented reality is a fascinating tool. And when combined with a little pyrotechnics, is even better. With ‘Burn That Ad,’ we hacked the competition by leveraging our biggest advantage, which is fire”, said Rafael Donato, creative vice-president for David SP. Only a day has passed, and the appeal has spread like wildfire. There are already a half-million free whoppers expected to be given away to customers across the country, with vouchers being limited to one per customer. With such a user turnout, it’s clear that Burger King’s turning the heat up on more than just its flame-broiled burgers.